The 2018 Chevrolet Impala with an aesthetically pleasing design supports aerodynamic performance. The powerdome hood, wide chrome grille and available High-Intensity Discharge headlamps establish a confident presence. The Impala is built for precision handling with its premium electric rack-and-pinion steering, tight steering radius, and an available variable-effort feature increasing the level pf power assistance during low speed maneuvers. With 2 engines matched with 6-speed automatic transmissions, the Impala has astounding fuel efficiency! The ECOTEC 2.5L 4-cylinder with 197hp comes with Auto stop/start technology and an EPA-estimated 22 MPG city/ 30 MPG hwy. The available 3.6L V6 with 305hp comes with Direct Injection and Variable Valve Timing. While getting an EPA-estimated 19 MPG city/ 28 MPG hwy, this Impala goes 0 to 60 mph in just 6.8 seconds! New exterior design packages are available with the 2018 Chevrolet Impala. Midnight Edition Appearance package includes 19″ Special Midnight Edition Black painted pocket wheels, front and rear Black Bowties, Blacked-out grille and Pedal cover set, and requires Black exterior color. Although it is only available on 1LT and Premier trims, the Midnight Edition includes rear spoiler and P245/45R19 all-season, blackwall tires. Also available is the Driver Confidence Package that includes Rear Cross-Traffic Alert, Rear Park Assist and Side Blind Zone Alert with Lane Change Alert. The Premier Confidence Package includes Forward Collision Alert, Land Departure Warning, Adaptive Cruise Control, 20″ aluminum wheels and P245/40R20 all-season blackwall tires. More on the New 2018 Impala? 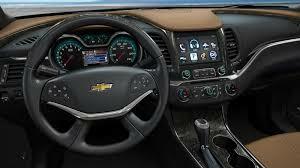 Call us at Landmark Chevrolet in Randolph, NY or stop in and see us!